Rockport, Texas is being invaded: 14 million Ruby-throated hummingbirds fly into this suburb of Corpus Christi in a period of 48 hours. They are about to undertake the most remarkable journey, flying non-stop over 1,000 kilometres across the waters of the Gulf of Mexico. The trip will take 25 hours without a possibility to pause. By the time they arrive in Rockport, the tiny birds weigh only 4 grams. That is dangerously little: they do not have enough fat to fuel the flight. For this, they need to weigh 6 grams – so they have to add half their body weight very quickly. The local people put up feeders around which hundreds of hummingbirds swarm. They feed and put on weight, ready for this critical and dangerous stage of their migration. After bing-eating, the birds set off. The local coastguard and military can now track the hummingbirds as they fly across the sea by radar. This film reveals the remarkable lives of hummingbirds – one of nature’s most fabulous creatures. Everything about them is superb and extreme: highest metabolism, fastest heart beat and most rapid wing beat. This remarkable specialisation has been driven by flowering plants. 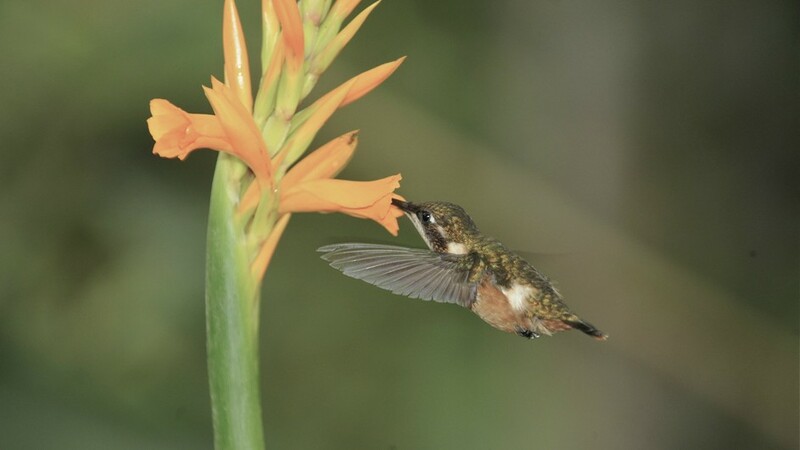 Everything about hummingbirds has been shaped by this association – and in that relationship the plants provide and the birds work in their service. The hummingbirds are the plants’ messengers – the key pollinators for 60% of the New World tropical plants. They pollinate plants in extreme climates where insects are unable to fly – like in the high Andean mountains of South America. The reward for the hummingbirds is a kind of ‘rocket fuel’: the plants’ super high-calorie, sugar-rich nectar. But to obtain their high-energy fuel the birds have to expend huge amounts of energy – most obviously in hovering flight. Of all the birds, only hummingbirds can hover for any length of time. And more than this, hummingbirds can fly backwards and even, just occasionally, upside down. In other birds, the power is created in the outstretched down stroke of the wings; and then the wings are folded and lifted back to the start position for another power stroke. In hummingbirds, when they hover, both wing strokes create power and lift. This film combines scientific revelation with astounding photography, capturing some of nature’s most remarkable and loved creatures. A wonderful visual tour-de-force – it uses ultra high-speed HD cameras and cutting-edge remote systems to enter the fascinating world of hummingbirds.